It’s funny to me how people who don’t live in America can think that we Yanks have “great” candy here, while at the same time Americans with candy knowledge generally think that multiple countries do it better than us. This is the rare case of no one being wrong. It’s familiarity — we get tired of what we know, and when we try something that’s tasty but more importantly new to us, we go off rail. So do I really think that American candy, or as I like to call it, Halloween Candy, is weak? Hell no. Sometimes there’s absolutely nothing better than a Butterfinger. Actually, most of the time that’s the case, especially the tiny sized ones. But the list doesn’t stop there for me: Heath Bars, Snickers, Twix, Jolly Ranchers — there’s an amazing amount of excellent American candy. 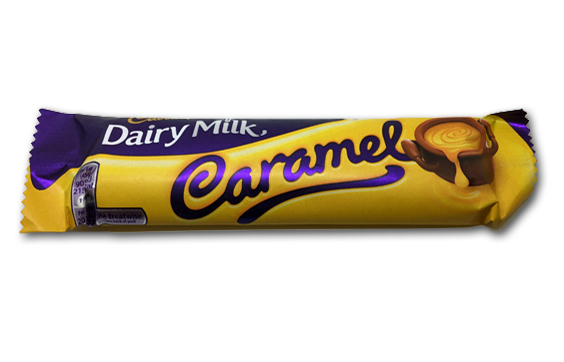 I love caramel-you know this. But I’m a bit picky about it: I prefer it to be chewy rather than runny, and of course, it needs just a pinch of salt to make it sing. 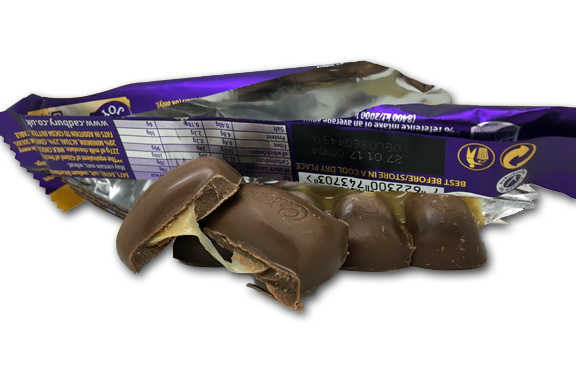 Curiously, of all the conversations about Cadbury, I hadn’t heard anything about this particular bar-but this ain’t rocket science. Simple concept: milk chocolate (or “Dairy” as they call it, which is kinda cooler) enrobed caramel chunks. I’ll save you the suspense: this delivers-on all counts. Yes, you can see the caramel pulling a bit, but it’s not runny, it has a nice chew to it. There are 6 little pods of caramel, and you break them off one at a time. The chocolate is Cadbury dairy of course, and if you listen to the American candy haters, there’s absolutely no comparison between this and Hershey chocolate, or any other mass produced American chocolate for that matter. I can’t say I disagree with that sentiment, as there’s just something more creamy and simple and REAL about this. You might think that this has something to do with ingredients, but the lists are extremely similar. What that tells me is that Cadbury’s using a higher class of ingredients. Regardless, this candy bar is wonderful. And guess what? You can get ’em here, right on the ‘Zon. I definitely recommend these for anyone who has a caramel obsession. Yummy, original, ….there’s really nothing not to like about this bar.